When your smile isn’t everything you hope, it can impact how you interact with others and how you feel about yourself. With the right cosmetic dental treatment, you can have a smile you’re proud to wear. At Drummond Dental Group, we believe that everyone deserves a winning smile. 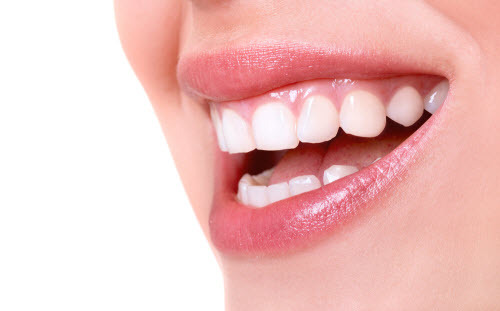 Our experienced dentists use innovative technology and techniques to design and deliver cosmetic services that can effectively enhance your dental esthetic. Are you anxious for a smile that reflects your inner self? Schedule a consultation to learn more about what we can do for your smile. How Can Cosmetic Dental Treatments Help My Smile? Cosmetic dental solutions feature a variety of treatment options designed to improve a smile’s esthetic. Whether you want your teeth to be whiter, you have a chipped tooth, or you want to make more extensive changes to your smile, we can help you achieve it. Do Cosmetic Services Have Other Benefits? Several of these treatments aren’t just about visual enhancement. Treatments like fillings, crowns, inlays, and onlays also have restorative benefits. They help to protect and strengthen your teeth without compromising the beauty of your smile. Which Cosmetic Treatment Should I Get? When you visit us for a cosmetic consultation, we take the time to hear your concerns with your smile and learning what you want to achieve. We perform a thorough exam and make recommendations based on your goals and dental situation. Depending on what you want to accomplish, our recommendations could involve a single treatment or a custom treatment plan – whichever will provide the results you’re looking for. If your exam reveals signs of health issues, we will likely recommend addressing these issues before proceeding with cosmetic treatments. Healthy teeth are the foundation for a beautiful smile, and unresolved health issues could make your treatment less effective and short-lived. No smile is perfect, and many people have something about their smiles they wish could be better. When it comes to your smile’s esthetic, we have a solution for whatever issue you’d like to resolve. It’s common for teeth to become dingy or stained over the years. Professional teeth whitening offers a powerful way to help patients restore their teeth to their natural shade. Our practice provides in-office and take-home whitening to help our patients conveniently brighten their smiles. Dental enamel is slightly porous, allowing dark or acidic foods to leave stains below the enamel. Since brushing, flossing, and mouthwash only cleans the surface, these stains build up to gradually hide the natural enamel color. The most common culprits for staining include coffee, soda, tea, wine, berries, tomato sauce, and citrus. Your enamel can also be discolored by things other than stains, especially dental trauma. Because this occurs in the tooth layer below the enamel, it is often permanent. A different type of cosmetic treatment, such as veneers, may be needed to hide this discoloration. How Much Would Teeth Whitening at the Dentist Whiten My Teeth? This depends on two factors: the level of staining and your natural enamel color. Teeth whitening doesn’t change the color of your teeth. Instead, it removes stains to restore your original color. Natural tooth enamel is not pure white, but a pale shade of yellow or grey. The dentist will show you an enamel color chart before your treatment so you can see what to expect and how effective your treatment will be. Our office provides two types of teeth whitening. One is performed in our office and supervised by our team; the other is a customized whitening kit you can use at home. Both options use a potent bleaching gel delivered via a custom-fitted tray, which ensures your results will be uniform across your entire smile. The whitening gel penetrates below the surface layer of the enamel to eliminate built-up stains. In the office, this is typically done in three fifteen minute whitening sessions, and the whole process takes around an hour. 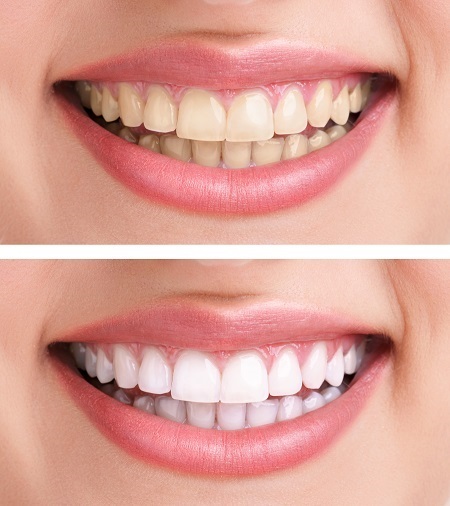 Depending on the level of stains, whitening can leave your teeth several shades brighter. We are proud to be an exclusive provider of Bioclear in Montreal. This treatment allows us to conceal unflattering gaps and triangular spaces between teeth without reshaping the tooth. If you’re unhappy with dark spaces along your gum line, a quick consultation can help us determine if Bioclear is right for your smile! Bioclear is a composite resin that bonds to the tooth, filling in gaps to reshape and complete the tooth. This process is specially designed to deal with spaces at or near the gum line. How Does Bioclear Help My Smile? When the teeth are narrower at the root than their crown, it creates the appearance of a black triangle between your teeth. This creates an awkward appearance, and can also make it easier for food particles to get stuck between the teeth, leading to cavities and gum disease. With Bioclear, custom molds are made to create the desired tooth shape and are filled in with a dental composite resin. The resin is matched to your tooth enamel, creating a clean and natural look. This method is minimally invasive, and involves almost no changes to your tooth enamel. Take a closer look at our photo gallery to see how Bioclear has helped our patients enhance their smiles. Veneers are typically made of either porcelain or composite resin. Some dental offices focus on one type over the other depending on the needs of their patients. Our dentists can discuss with you to determine which type is preferable for your smile. What’s it Like to Get Veneers? The veneers process starts with a consultation, where the dentist gets to know what you want from your smile. They then work with you to plan your veneer treatment, deciding things such as how many teeth receive veneers and what materials to use. You may also try on models or temporary veneers to get a better idea of how the veneers will change your smile. Once your veneers are designed and made, the dentist shapes the front of your teeth. This prevents the veneers from looking bulky and creates a better hold. A dental cement helps the veneers stay in place, and they become part of your tooth structure. How Does the Dentist Design My Veneers? It can take a little time to get used to veneers after you first get them, but many patients forget after a few weeks that they’re even wearing them. Here are some handy tips to start practicing once you get your veneers! Brush Twice a Day: Just like your normal enamel, your veneers last longer and look better with regular brushing and flossing. Use a Soft-bristled Brush: Brushing hard or using a hard-bristled brush can scratch your enamel, making it easier to stain or wear down. Be Careful when Biting: Biting down on hard objects like ice cubes, hard candy, and certain nuts can damage your veneers. Be Patient: Don’t be stressed if your veneers affect the way you speak or eat when you first get them. This is normal and won’t take long to adjust to it. Visit the Dentist Regularly: Be sure to keep your six-month appointments so the dentist can help you keep your veneers in good condition. You’ve likely seen a composite filling, but you may not have actually seen it. Also called white fillings, these fillings use a tooth-colored material to fill in spaces and cavities while preserving a tooth’s esthetic. The material is carefully matched and shaped to the enamel, making it near impossible to tell what is enamel and what is the filling. There are several factors to consider when thinking about having a filling replaced. These five questions can help you and the dentist work together to decide what’s right for you. How old is your filling? An older filling is more likely to fail, which may affect when and how you want to approach replacing it. What condition is it in? If the filling is in bad condition, it should be replaced. Are there any signs of leakage or a new cavity forming? If the cavity seal is broken, or the tooth has decay, it needs to be addressed quickly. How big is the filling? A large filling may be better treated with an inlay, onlay, or dental crown, depending on the situation. Where is the filling located? Fillings in the back face more chewing stress, so the dentist needs to assess how the pressure over time will affect the filling. Inlays and onlays are two types of restorations used on teeth with damage or decay. Like crowns, they are designed and created in a dental lab, but they do not cover the entire tooth. They are typically used in cases where the space is too big for a filling, but a whole crown is not needed. Inlay: An inlay covers the middle chewing surface between the cusps (points) of a molar. Onlay: An onlay covers the middle chewing surface and one or more of the tooth’s cusps. You have a large cavity. You’ve had a root canal. You have a fractured or broken tooth. You have worn or oddly shaped teeth. You have a large filling. You have cosmetic issues, and other cosmetic treatments aren’t viable. Drummond Dental Group is committed to helping our patients enjoy healthy, beautiful smiles. Our talented dental team is proud to offer quality cosmetic services in Montreal, and we’re excited to help you achieve the smile of your dreams. Are you ready for a dazzling smile? Contact our office and make an appointment today!